Carmelita is one of the most northerly villages in Guatemala, accessed by a rough, undulating dirt road out of San Andres. No problems there, bar the odd axle deep, wheel swallowing pothole. From Carmelita, it’s then 65km by foot to El Mirador, the jungle-clad Mayan ruins said to dwarf even Tikal – as used in Mel Gibson’s Apocalypto. I’d heard it was a fairly well defined path, rooty in places, the odd carry – and of course I wanted do it by bike. As you can see from the pictures below, I soon realised that in my current state of health, this really wasn’t the time of year to be embarking on such an adventure. From what I heard, the dry season would be a different story altogether – but with rain scheduled till November, I had to bail. However, it did give me some ideas about how to go about this kind of journey in the future. Given the routes I like to travel, it’s not the time I’ve encountered mud like this, or even snow and ice. Food for thought on aspects of the setup I’m running, especially given that I’m headed deeper into the rainy season. The starting point is running a frame with the biggest clearances you can find, and a clean setup that doesn’t offer mud much of an excuse to cling to. Thorn’s Sterling frame fits the bill nicely. Pick out some mechanical disc brakes, like Avid’s BB7, which are simple, reliable and won’t scoop up muck like V brakes. Next, run a rigid fork, again with monster clearances, from the likes of On One or Surly. I had leaves and crud jamming under the brace of my suspension fork and between the V brakes every 20 metres I rode/pushed, grinding the bike to a complete, power depleting standstill. This was made all the worse for the double arch design of the Maguras. 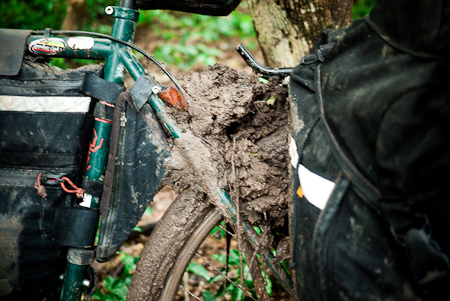 Lose the rear rack so mud has a path to exit the frame, rather than getting trapped inside. To do this, you ideally need to travel light enough to fit everything into a frame bag, an expandable seat pack and a front sling (from the likes of Porcelain Rocket, Revelate Designs or Carousel). 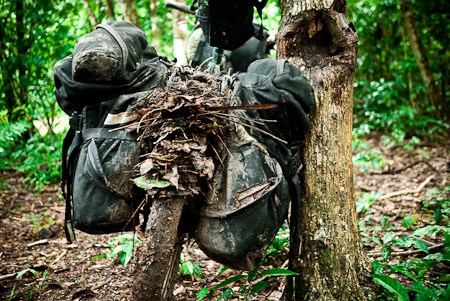 I’m not a fan of carrying kit on my back while I ride long distances, but in this situation, wearing a pack with lightweight, bulky kit would make sense. Or if that doesn’t allow enough capacity for food, tow a lightweight single wheel trailer too, like Extrawheel’s Voyager, or Tout Terrain’s Mule. That way weight is nicely distributed across the bike and trailer – given you the added benefit of a detachable, shorter range mountain bike for exploring when you’re there. I’m always to-ing and fro-ing between panniers and trailers on trips that involve a lot of off road, technical riding. Despite their extra bulk and weight, one advantage trailers offer is a reduced wear rate on kit, and the opportunity to run lighter rims and tyres. Perhaps a framepack/seat pack setup, combined with a trailer, are the ideal setups for the kind of riding I enjoy. No doubt I shall continue to deliberate over that one, as I tend to do. Needless to say, the Rohloff internal hub – as fitted to my Thorn Sterling frame – is a massive advantage over derailleurs in this kind of situation, just as it has been for snow and ice over the past months. At its worst, the rear wheel locked out every few metres. Ironically whilst it was raining, it was easier to ride. 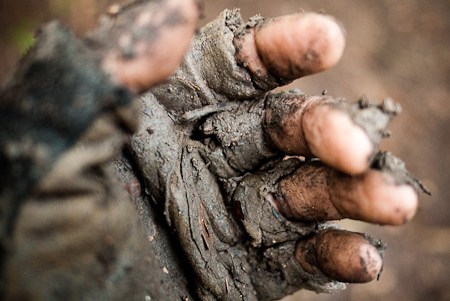 Once conditions started to dry out, the tackiness of the mud acted like glue for forest detritus. V brakes + rear rack = locked rear wheel. And lots of extra weight. The Thorn Sterling has generous clearances, so with discs and no rack, there just might be enough space for mud to find its way out, keeping the wheel turning. Maybe. The double crown of the Maguras may well provide extra stiffness, but it’s also proved to be a great way of tidying up leaves from the forest floor… A rigid fork with lots of room would certainly help. While I was scouring the skies for a hint of sunshine, these local Carmelitan kids were loving the rainy season. They messed around and slid about in the football field as the rain bucketed down. This entry was posted in Bike Talk, Guatemala on June 27, 2010 by Cass Gilbert. I hope you’re feeling all better now and haven’t had a mud induced relapse. 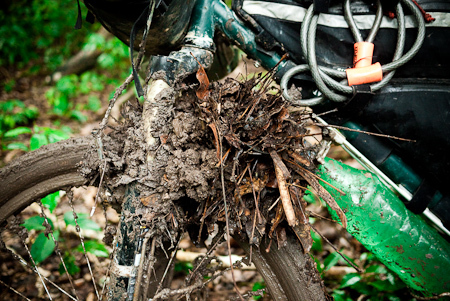 yes, I read about your muddy struggles too… It sounds like Cuba is paved for the most part, so perhaps backcountry riding will be easier there. enjoy! Carmelita should be Caramelita – being the operative word here! I hiked into El Mirador in 1990, drought, snakes, dodging Mexican paramilitaries, is the trail is any better these days? It was too muddy ride, so I later hiked it with a friend. We got lost and took a wrong turn for a few hours but once we’d backtracked, it wass , but after it relatively straightforward. There’s a main, ripped up mule path from the archeologists and tourists heading in with pack animals. In fact, you can link it onwards into Mexico and some of the ruins there – even bike it, as long as it’s the dry season. That might be pretty tough navigation though. I’d love to go back and try.